Inversion tables are usually recommended for back pain, but many of you may not know all of the other benefits that come with using an inversion table. In this article, I will talk about the many benefits of inversion tables and why it is a good investment for your health. Rehydrates discs in your back: Standing, sitting and moving can dehydrate the vertebrae in your back. When you invert, the back elongates, creating room between your discs and giving them a chance to absorb moisture. This can help to absorb shock to your back and to increase your own flexibility. Reduces nerve pressure: As you create more room to absorb moisture in your vertebrae, you also create more room for your nerves to work as they should. Hydration of the discs allows for more room for your nerves and decreases the chance to pinch a nerve, which we all know is extremely painful. Realigns the spine: Many of our daily activities put pressure on our spine, as we’ve talked about. This also can lead to postural changed and misalignments in our spine. As you invert, the spine lengthens and give it a chance to put our spines back in the correct place. Relaxes the muscles: As you invert, your muscles stretch, which helps with those sore and tight muscles. Eases Stress: Stress can come out in many ways, even physically. Most often, our stress shows up in our shoulders and back, leading to tense muscles and soreness. Even Yoga practitioners have seen the benefits of inverting your body. When your body is more relaxed, your mind will be more at ease and you’ll be able to relax better. Improves Joint Health: Decompression helps to lubricate your joints by altering the suction and pressure forces in your joints. Your ligaments will strengthen when you mobilize them and this can help to increase the amount of collagen that is in your tissue. Increased Flexibility: Lack of flexibility comes from tight joints and stiff muscles. When you invert, you take the pressure off of the joints and muscles and help them to work better, which also helps you to be more flexible. When your bones are closer together, you lose height and, in turn, lose flexibility. Improves Fitness and Builds Core Strength: When many people invert, they also do exercises such as crunches to help build the abdominal muscles. When you do crunches while inverting, you can target your core muscles without the added risk of compression to your spine. Also, some people do squats while inverting, which helps to improve your leg muscles. Improved Circulation: Inverting allows your veins to relax and rebuild themselves while draining out extra blood that may sit in some of your veins. Inverting has been shown to help improve varicose veins. As you can see, there are so many benefits of inverting for not only yourself, but your body as well. 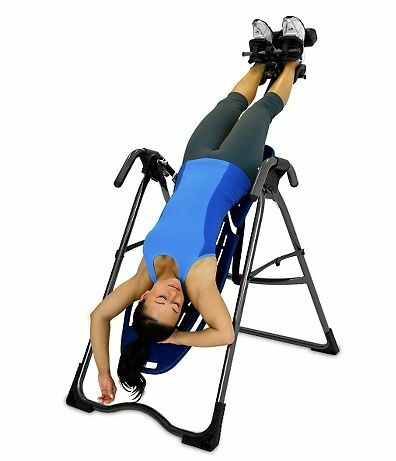 If you are considering an inversion table, I would recommend the Inversion Table Pro Deluxe Fitness Chiropractic Table. Of course, you should check with your doctor before starting an inversion routine simply to make sure that it is best for you, as some problems can be made worse by inversion therapy.